Time Sheet Summary Report' under the tab Reports to view the number of hours employees have clocked in total by day through the Time Clock. 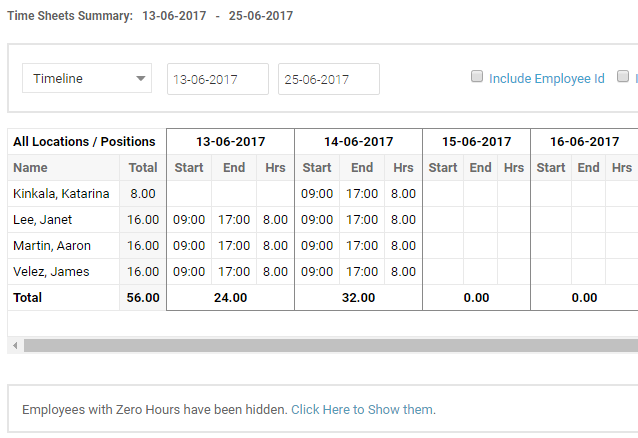 The report shows the user 'Name' and the 'Total' hours for the selected date range. Then you see the shifts with the 'Start' time, 'End' time and the shift 'Hrs'. At the bottom of each day, you can see the 'Total' hours for that day. You may choose a predefined time period or select your own date range from the top of the report. If you want to narrow down the employee list, you can choose to view by 'Employee' name, 'Position', 'Locations' and 'Skill'. All Timesheets filter let managers choose between Approved & Unapproved TimeSheets.